While the world’s attention has been fixated on the rapid advance and conquering of territory by ISIS/ISIL in Iraq, a clear shift has taken place in the rhetoric against, and analysis of, Prime Minster Nouri al-Maliki and his government. Though he was praised up and down by Washington while US troops remained on Iraqi soil, in the nearly three years since their exit he has transmogrified into a brutal sectarian autocrat evoking the worst aspects of both Saddam’s regime and that of his Shia neighbors and allies in Iran. What could possibly account for such a dramatic about-face? The question then becomes: Is it simply that the world has finally taken notice of Maliki’s dictatorship against the backdrop of the war against ISIS/ISIL? Or could it be that the narrative has changed because the US agenda and interests have changed, and thus, so too has the image of Maliki. From democratic representative of the religious/ethnic majority to vicious tyrant bent on the destruction of Sunni and Kurdish minorities, Maliki has undergone a shocking political makeover. Indeed, Maliki is not the first, nor is he likely to be the last, leader propped up, armed, and supported politically and militarily by the US, only to then become the proverbial “greatest threat to peace and stability in the region.” Such was Saddam’s fate. So too was it the fate of Jean-Bertrand Aristide in Haiti. And it seems now that Maliki, like countless other would-be US puppets who suddenly discovered their own national interests, has magically become the center of evil in Iraq and the region. It should be noted that an examination of how the narrative on Maliki has shifted should not be taken as a de facto endorsement of all his actions or policies. Quite the contrary, such an analysis is rooted in an examination of the facts and material conditions, rather than an emotional appeal to “pick a side” and “support the people.” These and other hollow phrases have adorned the writing of many analysts on this issue in recent weeks without thoroughly examining the real forces at play. As such, the hollow phrases turn into shallow analysis which leads to the confusion about Iraq today. It should come as no surprise to anyone who is even moderately aware of how US foreign policy and propaganda has historically operated, that the demonization of Maliki is directly linked to the inability of Washington to control him or, to put it another way, his refusal to accept US diktats. Consequently, he has been made into a villain, rather than a leader attempting to establish independent institutions in a country in which all institutions were created by the authority of a military occupation. So, the question then becomes, is Maliki simply trying to consolidate all power to himself? Or has Maliki been attempting to purge his government of US agents, clients, puppets, and other assorted front men? As is so often the case, the answer will lie somewhere in the middle. Today, I’m proud to welcome Prime Minister Maliki — the elected leader of a sovereign, self-reliant and democratic Iraq… Iraq faces great challenges, but today reflects the impressive progress that Iraqis have made. Millions have cast their ballots — some risking or giving their lives — to vote in free elections. The Prime Minister leads Iraq’s most inclusive government yet. Iraqis are working to build institutions that are efficient and independent and transparent. In examining these and other comments made by Obama, and Bush before him, it becomes clear that a tectonic shift has occurred in how Maliki is viewed by Washington. Once seen as a pliable, compliant client regime, Maliki has now become the embodiment of corruption, sectarianism, and lust for power. What could possibly have motivated such a drastic change? Maliki also took the absolutely monumental step of closing down Camp Ashraf and killing or expelling its inhabitants. Far from being a camp for “Iranian political exiles” as Western media have attempted to portray, Ashraf was the base of the Iranian terrorist organization Mujahideen-e-Khalq (MEK), an organization supported wholeheartedly by neocons (as well as most “liberals”) in its continued terror war against Iran. Of course, because Maliki dared to cleanse Iraq of these US-sponsored terrorist thugs, he was immediately convicted in the court of US public opinion which described the operation as an assault on Iranian “freedom fighters.” We know all too well what the US means when it describes terrorists as freedom fighters. But the Maliki-as-dictator meme has become a powerful device for shaping the narrative about Iraq. One of the primary methods of this narrative-building is establishing, and constantly reiterating, that Maliki has consolidated all power to himself by purging his government of political rivals. While there is undoubtedly some truth in the fact that Maliki has sought to sideline certain political figures who were unwilling to “play ball” with his regime in Baghdad, this is only half the story, the only half western media wants you to hear. The other side of that story is the fact that Maliki was left by the US with a government rife with factions and individuals who represented not Iraq, but Western political and financial interests. One of the patterns to which Maliki’s accusers point as an example of his dictatorship is his purging of key figures in major Iraqi institutions. However, these same accusers never mention exactly who was purged, and why. One of the principal examples of such purging was Maliki’s sacking of two key figures in the banking establishment in Iraq. Specifically, Maliki dismissed Sinan al-Shabibi, Governor of Iraq’s Central Bank, and Hussein al-Uzri, former head of the state-owned Trade Bank. These dismissals were reported as a power grab. However, for the most part, they fail to mention the critical fact that these two very powerful individuals in Iraq’s financial establishment are very close friends and associates of Ahmed Chalabi. This name should ring a bell for those who have followed the Iraq tragedy for these last twelve years; Chalabi was the darling of Bush, Cheney, and the neocons. A close political ally, Chalabi was originally envisioned by Cheney and Co. as the leader of the new Iraq, an Iraq which would be amenable to US political and corporate interests in the country. Though Chalabi was rejected by the Iraqi people, and was never able to establish political power for himself at the time, he and his neocon friends were able to embed their people in Iraq’s banking institutions, thereby giving the US effective control over credit in the country. As has always been known, power over finances is de facto political power and authority. So, was Maliki seeking to consolidate all power to himself? Or was he attempting to rid Iraq’s banks of corrupt agents of Western finance capital who had been undemocratically put in place by precisely those same forces who eagerly championed the destruction of Iraq? Maliki views these deals as representing a very dangerous initiative that may lead to the outbreak of wars… [and] breaking up the unity of Iraq…Maliki is prepared to go to the highest levels for the sake of preserving the national wealth and the necessary transparency in investing the wealth of the Iraqis, especially oil… [He] sent a message to American President Barak [sic] Obama last week urging him to intervene to prevent ExxonMobil from going in this direction. It is no secret that Maliki’s strong-willed resistance to this deal, in addition to his refusal to pay ExxonMobil upwards of $50 million to improve production at one major southern oil field, led directly to the oil company pulling out of the lucrative West Qurna-1 project. Essentially then, Maliki took on the very powerful oil corporations (BP is no friend of Maliki either), seeking to get a better deal for Iraq. It would be safe to assume that the endemic corruption in Iraq would have made it easier for Maliki and his associates to enrich themselves by skimming off the top and/or receiving payouts from other oil interests. However, this is secondary to the primary “crime” of challenging the hegemony of oil companies in Iraq. Doesn’t Maliki realize that the US fought a war in Iraq to protect and further the interests of oil companies, among others? Undoubtedly, Maliki’s greatest sin in the eyes of US-NATO-Israel-GCC has been his steadfast support for Syria and Assad. Maliki refused to abandon Assad when the US-NATO war machine was gearing up to bomb Syria. He loudly proclaimed his support for Assad and his resistance to any attempts to coax and cajole Iraq into allying against him. In this way, Maliki affirmed the alliance of Tehran-Baghdad-Damascus-Hezbollah against the US-NATO-Israel-GCC axis of power, and in doing so put himself at the top of Washington’s enemies list. In late 2013, Maliki, along with Assad and Iranian authorities, participated in continued negotiations over the proposed Iran-Iraq-Syria gas pipeline, which would bring Iranian and Iraqi gas to the Mediterranean via Syria, thereby giving those countries direct, overland access to the European market. Naturally, this was seen as a direct challenge to US ally Qatar and its dominance of the Middle Eastern gas trade to Europe. It should be noted that it is no mere coincidence that the eruption of the war in Syria coincided perfectly with the initial negotiations over the proposed pipeline. So, rather than a leader defending national interests and attempting to engage in independent economic development outside the hegemony of Western political and corporate powers, Maliki has been portrayed as a corrupt and brutal tyrant bent on destroying Sunnis, Kurds, and anyone else who stands in his way. Might it not have something to do with Maliki not being a willing puppet for a war on Syria? Almost as an afterthought are still other reasons why Maliki has been demonized. He has purchased significant military hardware from Russia, including attack helicopters, rather than being solely reliant on US military assistance. Maliki allowed Iraqi Vice President Hashemi, a politician known to be close with Qatar and the US, to be indicted and tried for running an assassination-for-hire operation. Maliki moved to reorganize Iraqi political life by breaking some of the deliberately dysfunctional political institutions created by the US occupiers after the initial war. He sought to use loans and credit to rebuild some of the destroyed infrastructure. He refused to allow Shia politics to be the sole territory of the Sadrists and others. These and countless other actions obviously demonstrated to the US and its allies that “Maliki must go,” as they are so fond of saying. Is the US Really Supporting Maliki? One of the more pernicious aspects of the coverage of the conflict in Iraq has been the propagandistic talking point from both mainstream and some non-mainstream outlets that the US is “supporting” and “propping up” Maliki. 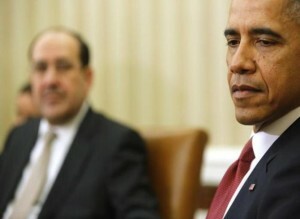 Dozens of articles and interviews have appeared in recent weeks in which experts espouse the notion that the Obama administration is trying to keep Maliki in power. Despite flying in the face of both logic and the facts, this narrative has taken root in many quarters, and has become the basis upon which many have provided de facto support to ISIS/ISIL and the Sunni insurgents allied, however tenuously, with them. It would seem that those who argue that the US wants to preserve Maliki’s position in Iraq have not been paying attention. Indeed, headlines such as “US leaders want Iraq’s Nouri al-Maliki to step down in return for US airstrikes on ISIS: Report” from the International Business Times, or “Iraq must form new government, Kerry warns in Baghdad” from the Financial Times, call into question that very assertion. In fact, it is not Maliki that the US is trying to preserve, it is its own influence in Iraq. This is the point that many so-called experts have utterly failed to grasp; Maliki is not doing what he’s told, so the US wants to put in his place someone who will. And they are using the ISIS/ISIL takeover as a convenient pretext for this sort of regime change. And whose name keeps coming up in discussion about who the US might want to see replace Maliki? It’s none other than good old Ahmed Chalabi, the same puppet who Bush and Co. tried to install in the first place. 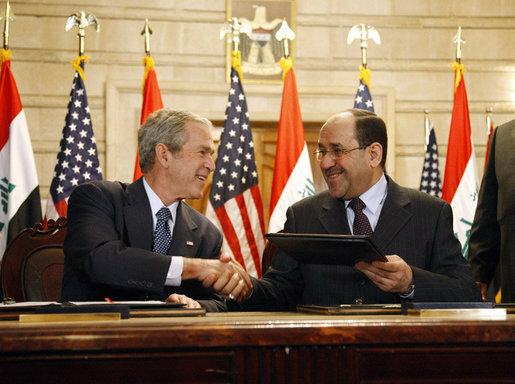 Ayad Allawi, another Iraqi politician with close ties to the US, is also on the short list. So, two failed US political proxies are now being promoted as the “democratic” and “inclusive” future of Iraqi politics. It’s enough to make anyone laugh, or be sick. It is also amusing to hear so-called experts discussing how the US has sent troops to Iraq to help Maliki. Such a superficial analysis reveals a complete lack of understanding of both military matters and the way in which the US operates abroad. The authorization for the deployment of 300 military personnel to Iraq is evidence not of an attempt to save Maliki, but to preserve certain key political, financial, and energy infrastructure for Western interests. Today Iraq is at war, and in danger of breaking apart. With Islamist militants and Sunni insurgents fighting a war against the government in Baghdad, the country is headed for total collapse and partition. But this war did not start with ISIS conquering Mosul. It did not start with Maliki consolidating power. It began before the last US troops ever left Iraq. It began when Maliki decided that he would not be cowed by US threats and diktats. It began the second Iraq tried to assert itself independently. And for this, Iraq is paying the ultimate price.